I could go with 50/50. The good black people can blame armed, ruthless gang members or violent thugs amongst the decent population for that. The police side should be ashamed for profiling because of experience. Each case is different. The 50/50 ratio is the worst grey area you could experience in any situation. If I knew for a fact, (which it is) that 13% of the population is committing around 50% of all murders nationwide, that 13% would make me very nervous and highly suspicious no matter who I am. That's not a problem with law enforcement, that's a cultural problem the 13% WILL NOT ADDRESS. They expect to be treated the same across the board regardless, which is bs. Law enforcement has every right and duty to be HIGHLY CAUTIOUS considering a supossed 50/50 ratio of making it home alive after every interaction. That's the nerve racking ratio a majority of LE are taught and firmly believe, especially if they are prior military. Broad brushing an entire race is wrong, but again if 13% are committing around 50% of all murders amongst other crimes at a comparable rate, what do you expect? a reply to: Tarzan the apeman. I heard Noory say on C2C tonight that there was bodycam footage that was not being released so as to not "negatively impact the integrity of the case". I think the other states of emergencies due to the pipeline were lifted. If not it is 6. And 6 would fulfill yout fantasies of an Obama martial law. So, to be nice to you, I won;t search to see what happened with the gas thing. You need something to sleep well. The Pipeline is back up and running as of last night. Everything should be back to normal in a few days gas wise. Those people doing what they are doing are Deplorables incarnate. Law enforcement has every right and duty to be HIGHLY CAUTIOUS considering a supossed 50/50 ratio of making it home alive after every interaction. I'm not sure you know what 50/50 means. I'm not an expert, but if half of all police officers in the country were killed at work yesterday, and then half of those remaining were killed today, seems like we'd be hearing about it. So how many states now are in a State of Emergency? Actually North Dakota is still in a state of emergency, at least according to the ACLU (as of September 13). That could have something to do with opening lines of credit as opposed to an actual disaster though. I can't find anything on state government or FEMA pages stating as much. I understand those are the numbers and conclusions thrown around, so I understand why you believe that's true. But, actually, no, you don't know that for a fact. That entire 13% of the population is NOT committing crimes, much less murder. Rather, in truth, a disproportionate percentage of all crime (including murder) is committed by a small subset of that 13%... Specifically, the gang members. And if you dig deep, you will also learn that proportionally, White gang members ( bikers, skinheads, etc) commit an even higher proportion than Black gang members. Violent protests raged in Charlotte for the second night over the police shooting of an African-American man, prompting the North Carolina governor to declare a state of emergency. One civialian reported to be deceased, is not. Moments after her father was shot, Lyric Scott had started recording on Facebook Live, screaming at officers on the scene. "They shot my daddy 'cause he's black," she said. "He was sitting in his car reading a mother******* book. So they shot him. That's what happened." The protests go on for a second night. Trump is coming, rest easy. 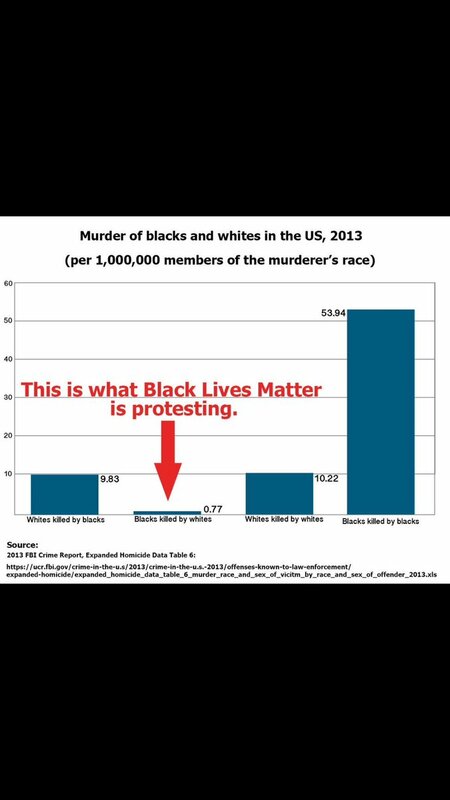 This BLM crap has gone on long enough.